We’re throwing out the décor rule book. Anyone who has watched even 10 minutes of HGTV knows that hardware is one of the quickest and easiest ways to upgrade your kitchen cabinets. Have you inherited a Mediterranean-style kitchen that’s 50 shades of brown? A lick of paint and new drawer pulls will save the day. Do you live in a rental that hasn’t been updated since Nixon was president? Just swap the cabinet knobs and call it a day. Warning: We’re about to throw a wrench in the oldest trick in the décor book. But here’s the kicker: It might actually save you money. Forget about those farmhouse bin pulls you’ve been eyeing and don’t even think of adding a set of coveted tan leather pulls to your cart because the next big hardware trend might just be no hardware at all. Taking a page from the sleek Scandinavian playbook, interior designers and architects around the globe are ditching their beloved shaker cabinets and brass pulls for a more streamlined seamless style—no hardware included. On the fence? We have a few examples that might convince you to embrace this next big kitchen trend. In Kate Watson-Smyth’s quaint Victorian London townhouse recently featured on Domino, black-hued open shelving and seamless cabinets replace a more traditional kitchen layout. Round cutouts replace drawer pulls, giving the space a minimal, modern look. Even the dusty-pink pocket door—which Watson-Smyth found in her cellar—is devoid of hardware. Though their style is minimalist in nature, seamless cabinets lend themselves to a wider range of spaces. 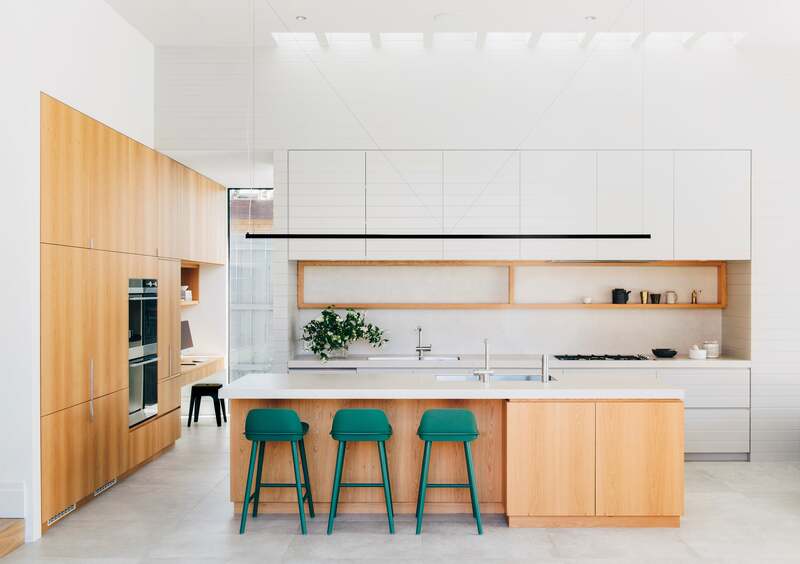 This Australian kitchen by Robson-Rak Architects has an almost rustic feel, thanks to the reclaimed wood on the cabinets. With fully integrated appliances, the kitchen virtually blends into the background, creating a sleek space that lets its materials shine. In a London penthouse, Jordan Cluroe and Russell Whitehead of 2LG Studio convinced their clients that baby blue seamless cabinets with round cutouts in lieu of handles were just what their dated ’90s kitchen needed. By carrying the soft hue into the upper open shelving and the living space, this design duo created a playful and inviting modern space. Ultra-seamless cabinets are the specialty of Australian architecture firm Robson-Rak. In this all-white double-height kitchen, cabinets are carried all the way to the ceiling, where the appliances vent lines up perfectly with a narrow window that runs the entire length of the pantry wall. Barely noticeable white handles make it easier to open and close the storage doors. Though many iterations of this trend feature monochrome spaces, it’s also not uncommon to see seamless cabinets in a two-tone kitchen. In this space by Naked Kitchens, dark blue upper cabinets complement the warm wood hue of the lower cabinets, creating a dynamic yet minimalist space. The wood is carried throughout for added continuity. We often think of kitchen cabinets as sticking out into the room, but as demonstrated here by this Melbourne kitchen, they can also be recessed into the wall. This increasingly popular kitchen layout frames the cooking area with upper cabinets and walls on each side. In this space, a wood spice rack adds functionality to the cooking area.